I first read an Anne McCaffrey book when I was 12. 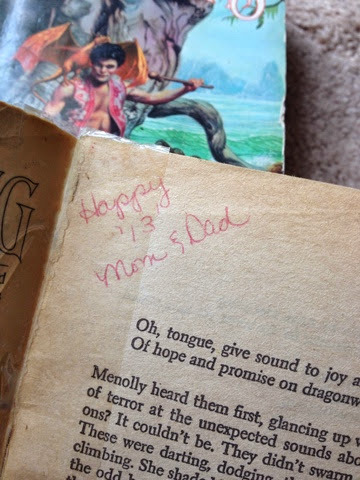 I know this because the book set my parents subsequently bought for me were inscribed for my 13th birthday. I have loved Anne McCaffrey ever since. 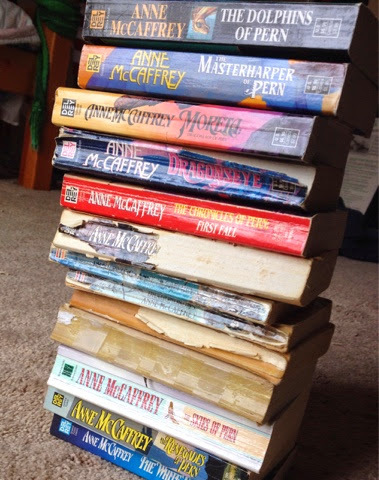 I introduced my own children to Anne McCaffrey's worlds at much younger ages. I don't know how old Gabriel was the first time he read about Pern, but Dominic has been listening to the audiobooks for at least 2 years. He is 11. This semester, we decided that a unit study of the Pern books was in order. Dominic and Xavier had been relistening to the Pern books in chronological order, but we decided to read them in the order McCaffrey wrote them in, as she suggested. One of the things I do when creating a unit study is to pull vocabulary words from the books, in addition to quotes, historical and scientific references, and more. Although I have been reading Anne McCaffrey's works for 25 years, I never realized until now how rich the language is in her books. And, because I have been writing down quotes I enjoy, I have also acquired a greater appreciation for her turn of phrase. Here are just a few quotes I've found from the first two books in our study, Dragonflight and Dragonquest. She was used to waiting. Perversity, endurance, and guile were her other weapons, loaded with the inexhaustible patience of vengeful dedication. Gratitude is an ill fitting tunic that can chafe and smell if worn too long. The black maws of the individual wears, set in the face of the inner wall, were voiceless mouths, greeting hime all astonished. Ah, but a man can sleep anytime. A laugh restores the soul. And, I think that last quote is my current favorite. "A laugh restores the soul."